USS Fitzgerald pierside at the U.S. naval base at Yokosuka, Japan in June 2017. The Navy plans to drop all criminal charges against two officers for their roles in the 2017 fatal collision of USS Fitzgerald (DDG-62), USNI News has learned. Former Fitzgerald commander Cmdr. Bryce Benson and tactical action officer Lt. Natalie Combs will no longer face criminal negligence charges for their roles and will instead be issued career-ending letters of censure from Secretary of the Navy Richard V. Spencer, according to a Wednesday letter sent to families of the seven sailors who died in the June 17, 2017, collision with the ACX Crystal off the coast of Japan. Public letters of censure are used to publicly shame service members but carry no legal weight. “This decision is in the best interest of the Navy, the families of the Fitzgerald Sailors, and the procedural rights of the accused officers. Both officers were previously dismissed from their jobs and received non-judicial punishment,” read a Navy statement provided to USNI News. The letter to the family goes on to say it’s the intent of Chief of Naval Operations Adm. John Richardson to drop the criminal charges against Benson and Combs. “The cases are being dismissed for legal reasons that impede the continued prosecution of either officer,” the letter read. Earlier this year, a military judge disqualified Director of Naval Reactors Adm. Frank Caldwell from overseeing Benson’s case due to actions in other legal proceedings related to the case. The judge said through the types of questions he asked of other sailors involved with other disciplinary matters related to the case, Caldwell showed in at least two instances he thought Benson had a direct responsibility for the collision. USNI News understood the Navy had limited options in finding a new consolidated disposition authority to oversee Benson’s case. In a statement to USNI News, Benson’s lawyer said that Navy would have a hard time proving criminal wrongdoing if the case had gone to trial. In a late Wednesday statement to USNI News, Combs’ attorney, David Sheldon, said his client performed her duties to the best of her ability. 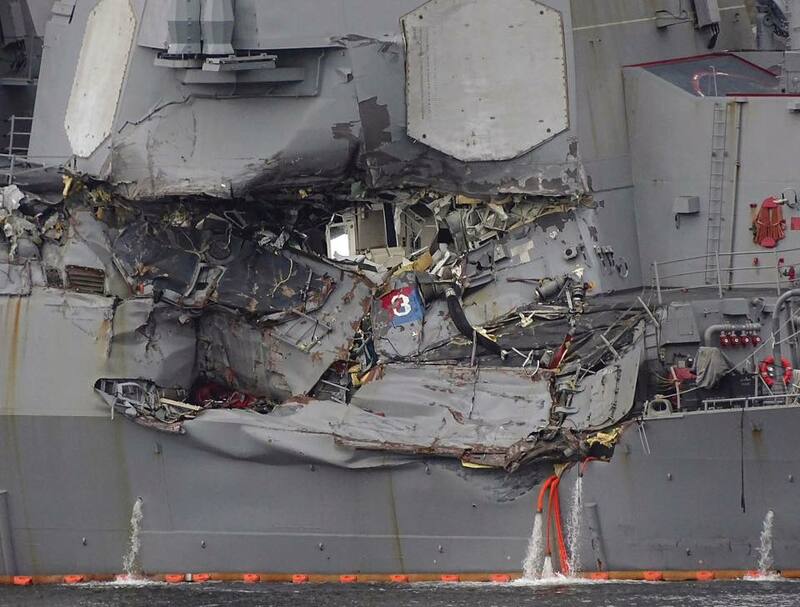 Issuing the letters and the dismissal of charges will be a quiet end to the criminal cases to against officers on Fitzgerald and on USS John S. McCain (DDG-56) during its fatal collision on Aug. 20, 2017, that resulted in the deaths of 10 sailors. In January 2018, Benson, Combs, surface warfare coordinator Lt. Irian Woodley and officer of the deck Lt. j.g. Sarah Coppock were issued charges that included hazarding a vessel, criminal negligence and negligent homicide. Coppock pled guilty to one count of negligence in a court-martial in May 2018. Woodley was recommended not to face trial by a military judge and instead stood before an administrative board of inquiry that moved not to separate him from service. The charges against Benson and Combs were eventually pared down, with the Navy dropping the negligent homicide charges.